There is nothing like waking up in the early hours of the morning, crawling out from your dew-misted tent, stretching your arms out to the side as you look up to the sun, and settling down with a nice cup of coffee or tea. One of my favorite things about camping is waking up before everyone else, sneaking out into the crisp morning air, starting a fire, and brewing a cup of my favorite grounds. As someone who appreciates a fine cup of coffee in the morning and the relaxing tradition of an afternoon tea, I know how important it can be to have a quality coffee maker or teapot. Caffeine and tradition enthusiasts such as myself may be able to do without a lot of home comforts when partaking in a camping excursion, but one thing will always remain vitally important to the enjoyment of their trips – coffee makers and teapots. In creating this website, my goal is to bring you the best of the best in terms of camping equipment and to compare all of those products in an effort to help you come to a well-informed purchasing decision. In keeping with that goal, and knowing how important a quality coffee maker or teapot is to a happy camping experience, I decided to create this page. Here, I will review today’s most popular, top-selling camp-friendly coffee pots and tea pots. If you would like some tips on selecting the right coffee maker or teapot for your needs, head over to your buying guide for some helpful advice. To learn more about two very popular (yet sometimes confusing) types of coffee makers, take a moment to read our article about percolators verses french presses. To make your search even easier, I have decided to not only create a list of impressive popular camp coffee makers, but also an even shorter list of what I believe are the top three coffee makers. As you can see, I’ve chosen to focus on the best coffee makers in three important categories – French Presses, Percolators, and Drip Coffee Makers. Since each type of coffee maker appeals to different people, I wanted to be sure I included your favorite type right here at the top of this section. These top three coffee makers have each received the best reviews from consumers for each of their categories and are each built with exceptional attention to design detail. 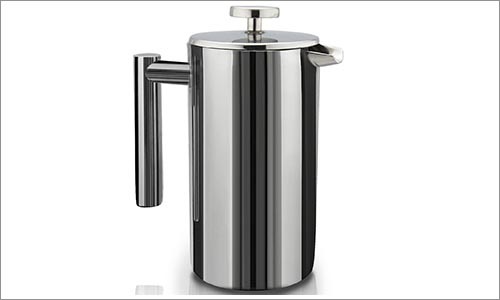 It is clear from consumer ratings that this Sterling Pro coffee press has been built with quality in mind. Although I do weigh my own opinions into my decisions when it comes to selecting camping products for top positions such as this one, I rely mostly on consumer reviews and ratings for a solid understanding of how these products perform in the wild. The ratings for this particular coffee press outshone all the others. This press is available in three sizes, allowing you to choose between 1 liter, 1.5 liter, and 2 liter options. The 1 liter press would be best for making single cups of rich, velvety coffee, whereas the 1.5 liter and 2 liter options would be best for 2 to 4 people. One of the things that sets this Sterling Pro apart from the competition is its double wall. The space between the two layers of high grade stainless steel traps warm air that serves to keep your coffee at the perfect drinking temperature for between one and two hours. The entire unit is crafted from stainless steel, making it virtually rust-proof. Most importantly, the stainless steel makes this press much more durable than the many glass-sided coffee presses sweeping through the current marketplace. Although it can be fun to watch your coffee press work its magic, a glass exterior is not practical for camping. Another wonderful feature built into this press is its double screen. Instead on simply placing one screen at the end of the plunger, the designers decided to include two screens. If there is ever a complaint I have had toward pressed coffee it is that grounds and silt seem to find their way into my cup. The fine, stainless steel mesh of these two screens holds back grounds and hardly ever lets any silt through when you tip the unit over to pour that steaming cup of liquid energy into your mug. Though I’ve already said that I have few complaints about coffee presses, I must admit that I would much rather use a percolator – especially for camping. In fact, I am actually considering getting rid of my current camping percolator to purchase this impressive GSI Sports PerkCup. Unlike most camp coffee makers on today’s market, this one is available in a large range of sizes. The five different sizes you can choose from include 3 cups, 6 cups, 9 cups, 12 cups, and 18 cups. Whether you need a percolator for your personal morning coffee or an entire group of campers, GSI Sports has you covered. I enjoy the zen moments I spend at the break of dawn, building a fire and relaxing as I wait for the bubbles in my percolator’s lid to turn a rich shade of brown. While some people prefer the instant satisfaction of instant coffee or electric coffee makers, I actually relish in this break from my usual hectic routine. What I do not like about using a percolator is trying to actually lift it from the fire once my coffee is ready. On more than one occasion I have burnt my hands and spilled the coffee while trying to remove the pot from the fire. GSI kept this struggle in mind when creating this PerkCup. Instead of crafting the entire unit out of steel they included a permawood handle, which can withstand the heat of sitting over a fire without growing scalding hot the way stainless steel does. Like any good percolator, this one includes a see-through knob so that you can watch its progress without having to open the lid and allowing the heat to escape. This particular knob has been created from lexan resin, a durable alternative to glass. No seams or welds mean that this percolator will never leak. After reviewing the astounding consumer ratings this drip coffee maker has received I had no choice but to include it here as the Best Drip Coffee Maker. Generally speaking, camp-friendly drip coffee makers are usually nothing more than a fabric mesh filter attached to a ring which sits on top of your coffee mug, which is why their consumer reviews are usually almost identical to one another. The GSI Java Drip is diametrically different, which explains why its consumer ratings were much higher than those received by its competition. Instead of dropping a mesh basket down into your cup, leaving less room for actual coffee and creating a swirling pool of coffee grounds, the Java Drip keeps all the grounds above your cup in its silicone funnel. The part that attaches to your cup is below the part that holds the grounds, allowing you to maintain the tight seal of a traditional drip coffee maker without taking up the same amount of space. Secure the bottom of the funnel to your cup, fill the silicone funnel with grounds, and slowly add hot water until your cup is full of coffee. 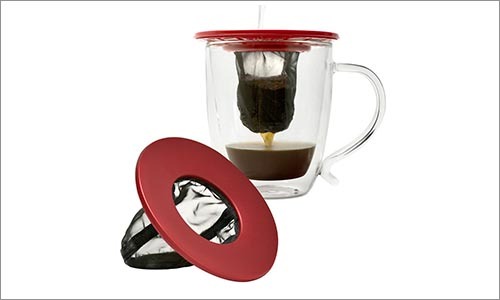 When the process is complete remove the device from your cup, empty out the wet grounds, rinse it off, collapse the funnel, and snap on the lid to protect this small coffee maker as you slide it into your bag. Measuring only 5.6 inches in diameter and 1 inch in height once collapsed, the Java Drip will take up a surprisingly small amount of space in your backpack. Despite my clear belief that the three coffee makers listed above in the Top Three section are the best of the best, I want to include a few more options for you here. Perhaps you are looking for something very specific – a certain type of material or a specific size or weight. If one of the choices listed above isn’t quite able to reach your very specific needs, I am willing to bet that one of these other five popular camp coffee makers will fit the bill. 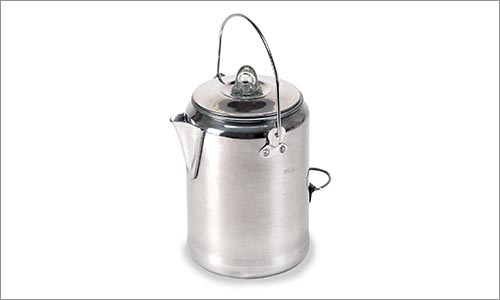 This polished aluminum coffee percolator may not boast the rust resistance of a stainless steel model, but it is still relatively rust resistant and outshines any stainless steel competitor in how quickly it boils water. Aluminum is an incredible heat conductor and thanks to that, this Stansport percolator will have you drinking coffee in about the same amount of time as a coffee press. Most percolators take quite a while to prepare a cup of coffee, which is one of the top complaints many people have about them. Though I am the type of person who actually enjoys the long process of brewing with a percolator, I imagine that there are a great many people who will be happy to hear of how quickly this particular percolator can brew. The glass knob affixed to the top of this unit allows you to watch as its contents turn from clear water to rich brown coffee without ever having to lift its lid. Lifting the lid will allow heat to escape and cause the entire brewing process to take much longer. Convenient measurement markings have been stamped into the side of this percolator so that you won’t need to guess whether or not you’ve included the right amount of water to match the amount of coffee grounds you’ve used. The nine cup capacity makes this Stansport perfect for brewing up to four mugs of coffee at a time, though you can always choose not to fill it completely and make only one or two mugs of coffee. I have to say that this is by far one of the most unique coffee presses I have ever seen. Instead of pouring the brewed coffee from a spout at the top of this press, you push the liquid through the grounds, out the bottom and into your cup. 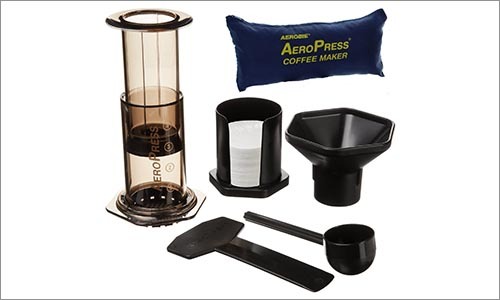 To use the AeroPress you will need a disc-shaped coffee filter which can be found online or at most camping and housewares stores. Place the disc in the bottom of the press, fill the desired amount of coffee grounds, fill the tube-like press with hot water, and allow the grounds to mix with the water for three to five minutes. When you feel that the grounds have soaked long enough, place the plunger in the tube and slowly begin to press down. Your pushing downward will force the water through the coffee grounds and out the filter at the bottom. Every ounce of flavor is squeezed from the grounds when you use this press. Instead of simply squeezing the grounds by pressing them against the bottom of a pot and hoping the flavor will make its way into the water, you will push the water through the grounds so that it can grab up extra flavor as it moves through. Like many of its competitors, the walls of this press are see-through, allowing you to watch as the water changes color and to see how much coffee is left inside as you push the plunger downward. Thankfully, this is not a glass piece. Though I normally prefer to work with glass when preparing food or drinks, plastic is much more durable and, therefore, much better suited to the camping environment. This single serve drip coffee maker will fit atop almost any cup or mug you can imagine. Its large plastic ring extends far enough outward to fit over wide-mouthed coffee-house style mugs while its mesh filter is slim enough to dangle inside a skinny travel mug. 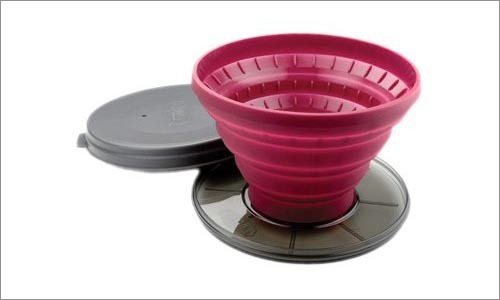 Up to four scoops of coffee can fit inside this large filter which means that you can even choose to set its wide ring atop a large jug to brew enough coffee for up to four people. As with most camping-inspired drip coffee makers, this one is very simple and easy to use. All you have to do is fit the plastic ring over the lip of your cup, allow the fabric filter to dangle inside, fill the filter with coffee grounds, and add hot water. Within less than a minute, you can be enjoying a fresh cup of steaming hot coffee. Tuck the mesh inside the space in the middle of the ring to store this compact brewing device in even the tiniest recesses of your backpack as you hike. Cleanup is very simple as well. Once your cup has been brewed, remove the entire ensemble from your cup, dump out the grounds, and rinse the filter. Cleanup will take less time than brewing, which says a lot since brewing is so quick and easy with the Brew Buddy. Although the dripper hasn’t been made of renewable resources, environmentally conscious people will be happy to know that it is 100 per cent reusable. Purchasing and disposing of one-use coffee filters is completely unnecessary when using this dripper. Let’s get one very important factor out of the way in this discussion of the Kona French Press – it is made from thermal glass. What does this mean for your camping experience? Most glass coffee presses aren’t designed for camping, because they can easily shatter. Luckily, the thermal glass from which this particular press has been created is much more durable than the glass typically used in the creation of French presses. This glass is shock resistant and has been fitted inside a silicone shell for even more protection. Of course, neither the glass nor the silicone should be placed over an open flame, but French presses do not require you to heat the water directly inside of them, anyway. The thermal glass will also help to insulate the press, keeping coffee warm for much longer in cool, outdoor conditions. The fine wire mesh screen included in this press will hold back grounds and silt as you pour yourself a toasty mug of coffee in the early morning hours or on a lazy afternoon. The screen can detach for easy cleaning and rinsing, keeping every cup of coffee as crisp and rich as the last. An extra-fine screen has been fitted over the opening of the spout to catch any grounds or silt that the main screen may have missed. This added protection ensures the perfect cup of coffee every time. This press’s thick, ergonomically friendly design helps you maintain a solid grip even in those early hours when your body hasn’t yet awoken. A rubber knob has been affixed to the plunger for extra comfort and to help you maintain a solid grip even with slick hands. With these many impressive features and the many more I simply do not have room to list on this page, it is no wonder that this Kona press was among the most popular, top-selling camp-friendly presses I could find. 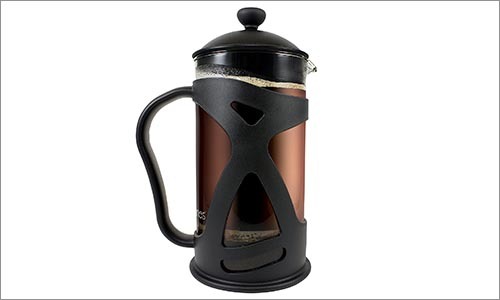 Available in either a 2-quart or 3-quart size, this coffee boiler boasts a stainless steel core and a porcelain enamel finish. The stainless steel core will ensure that this pot reaches high temperatures in a short amount of time. Since stainless steel isn’t the best heat conductor, this boiler’s lid should stay relatively cool throughout the boiling process. You will never have to worry about cleaning soot or baked-on coffee grounds from the exterior or interior thanks to the porcelain enamel. Unlike some non-stick coatings, the enamel used for this boiler is PTFE, PFOA and BPA free, making it much better for both you and the environment. The enamel is strong and will stand up to the wear and tear camping accessories inevitably face over time. It is safe to use on a burner or over an open flame, so that you can choose to boil your coffee according to your own preferences. Since coffee boilers do not feature screens to stop grounds from making their way into your cup, I thought it would be good to give you a handy tip here. If you add a little bit of cold water to the pot after the water inside has boiled, the grounds will stick to the bottom, allowing you to pour clear coffee from the spout without getting many grounds in your cup. There is an added benefit to not having screens and other apparatuses inside your coffee boiler, and that is that you can use it for many other purposes, such as boiling water for tea, soup, or sanitation purposes. It’s time to turn our attention to teapots and kettles. In the Top Three Choices for coffee makers, I selected one of each type of coffee maker. Since there is really only one type of camp-friendly teapot, I decided to bring a Top Three list which includes what I believe to be the best three teapots for camping. There really isn’t much of a difference between a teapot and kettle. In fact, people often argue about whether or not there is a difference at all. Some people believe that tea pots are more decorative and are made for serving, not heating. Other people argue that the difference between the two is based on shape (teapots are short and stout, whereas kettles are tall and slim). 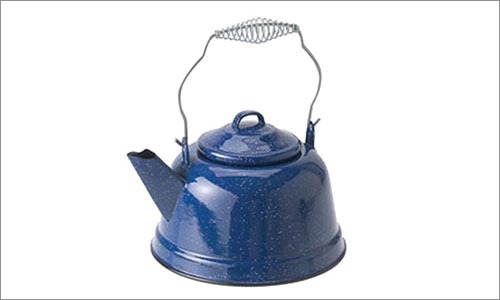 Still, other people argue that tea pots are silent, whereas kettles whistle when the water inside them begins to boil. For the purposes of this article, let’s just go ahead and assume that a teapot and a kettle are, essentially, the same thing. This Primus LiTech is crafted from hard anodized aluminum. I am a huge fan of this type of steel, because it gives you the incredible heat-conducting abilities aluminum is known for but is much stronger and more durable than typical aluminum. 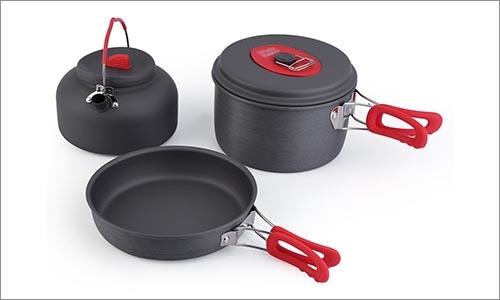 The anodizing process creates strong steel capable of handling the rough conditions most camp cookware must endure. Additionally, anodized aluminum has inherent non-stick qualities which will make cleaning this kettle an absolute dream. Measuring approximately six inches in diameter and three inches in height, this kettle’s low, wide profile allows it to reach its boiling point faster than its tall, slim competitors. If you are wondering about serving size, allow me to tell you that the Primus LiTech is capable of holding enough tea or boiling water to fill one to two mugs or teacups. Despite not being the best choice for cooking over an unwatched fire, I have chosen this kettle as the Best Overall because it has received outstanding consumer reviews. Undoubtedly, most of these reviews are from people who use camp stoves or who have been diligent enough to keep a close eye on the height of the flames in their fire pits. 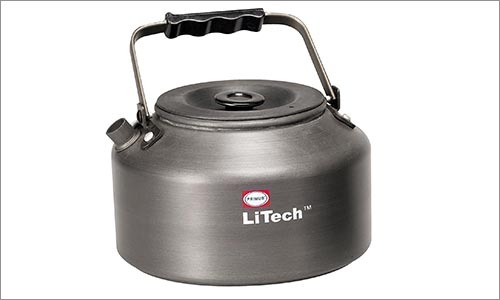 Some people may shy away from using this over an open flame because its handle has been fitted with a plastic grip and the knob on the top of the lid is also made of plastic. In my experienced opinion, neither of these should pose a risk of melting or burning if you are able to maintain a controlled fire. In actuality, it is best to place all camp cookware over hot coals or small flames as opposed to large flames, so I doubt that this handle will cause much of a hassle for experienced campers. The plastic handles give you the added benefit of being able to lift this kettle without worrying about burning your hands. If you are in search of an extremely durable kettle that you can leave sitting over an open flame without a care in the world, the GSI Outdoors Glacier may be just what you’ve been searching for. Crafted entirely of elegantly brushed stainless steel, it can withstand anything your camping or backpacking adventure can throw at it. From an open flame to a tumble down a hillside to a damp environment, this resilient kettle can handle it all without melting, breaking, or rusting. The thin stainless steel features a groove perfectly sized to fit around a pot hook or whatever makeshift hook you may create out of sticks and twigs. The handle folds down to cradle the kettle’s side making it more compact for storage purposes. 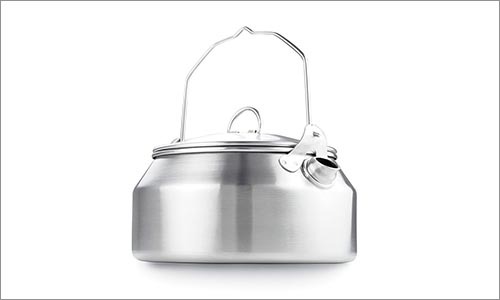 Just when you thought that a fully stainless steel kettle may too large to carry with you on a backpacking trip, GSI decided to make this particular kettle large enough to house a small fuel canister. Therefore, this pot doesn’t really take up much more room than the canister would on its own. Consumers report that, given its size and the fact that it is made from steel, this kettle is surprisingly light, making it even easier to transport. If space and weight are an important consideration for you, this LevelOne collapsible kettle might be what you need. As someone who has ventured out on numerous backpacking expeditions, I understand the importance of small, lightweight gear. Though this kettle should not be used over a fire, it can be easily heated over small fuel canister. Most backpackers know that carrying a small fuel canister is important in case rain approaches and renders nearby wood sources useless in creating fire. Simply use whatever canister you were already planning to pack to heat this simple one-serving kettle. The silicone body is lightweight and flexible. It shouldn’t add much weight to your pack, allowing you to add more important items such as an all-purpose knife or a change of socks. The body folds up into itself, creating a slim, condensed package that can easily slip under or around everything else you have packed. When collapsed, this kettle measures between two and three inches in height. 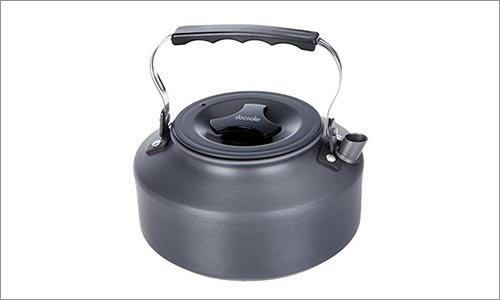 Compare that with other camping-friendly kettles and you will find that it is two to three inches shorter. That extra two to three inches, spread out over the diameter of a typical kettle, gives you approximately 12 to 18 square inches of extra space in your pack. A plastic lid has been attached to hold back extra tea as your pour, allowing you to maintain optimal control over your pouring actions. A lever extends from the lid and down the handle so that you may open and close the lid without running the risk of burning your hand on any steam which may escape. I cannot assume that the three teapots listed above will be sufficient to meet everyone’s needs – everyone’s needs are different. I do stand by my choices and believe that the majority of people will be reasonably satisfied (if not blown away) by the three teapots listed in the Top Three section. Nevertheless, I decided to include six more great camp-friendly teapots, on the off chance that you are one of the people whose needs fall outside the norm. Hopefully, if one of the Top Three teapots wasn’t able to impress you, one of these other popular options will. The GSI Outdoors Halulite bears a striking resemblance to the GSI Glacier at first glance. It features a similar low-profile design which won’t take up much space in a backpack. It also features a very similarly-styled, foldable handle with a groove fitted perfectly for a pot hook. Another similarity is that the designers ensured that this kettle, like the other, features an opening large enough to fit a small fuel canister. This kettle differs from the Glacier in two important ways. First, whereas the Glacier is crafted from stainless steel, this GSI Outdoors is made from hard anodized aluminum. This type of aluminum is actually stronger than stainless steel, making it slightly more durable. Even more convenient is the fact that hard anodized aluminum has natural non-stick qualities. The Halulite gives you all the convenience of a non-stick coating without the worry of PFTE, PFOA or BPA. Knowing that hard anodized aluminum is stronger than stainless steel, you may wonder why this kettle didn’t make it into our Top Three Choices as the Most Durable camping kettle. I will tell you that it was a close call between the two. Unlike the Glacier (which did make its way into the Top Three Choices), the Halulite isn’t made completely of metal. Its handles feature a plastic coating which may not stand up as well against high-heat environments and large flames. 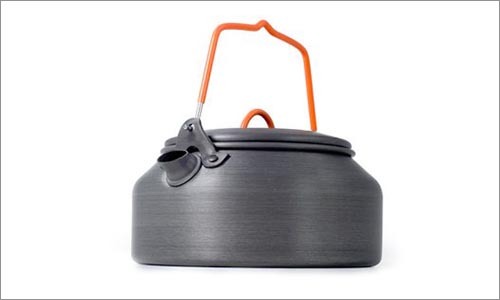 Still, the plastic coating has one important plus side – it stays cool, allowing you to lift this kettle from the camp stove or fire without burning yourself. 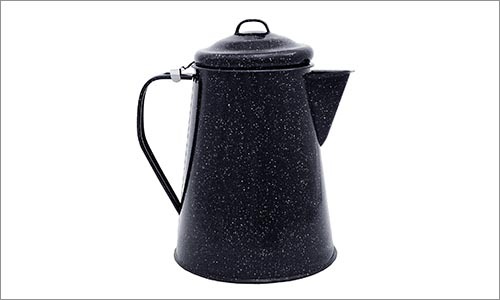 This small kettle is made almost entirely of hard anodized aluminum, which means that it is durable, non-stick, rust-resistant, and heats very quickly. While stainless steel kettles are almost as durable as hard anodized kettles and are slightly more rust-resistant, they cannot boast the non-stick and heat conductivity qualities of this Outer EQ kettle. The anodization process turns what would be difficult-to-clean aluminum into a non-stick surface fit to rival the best non-stick coatings on today’s market. This means that if you use this kettle as a substitute for a cooking pot, you won’t have to struggle to clean food stuck in corners or grooves – it will just wipe right off. Aluminum is known for its unbeatable heat conductivity. You can even pour cold water into the Outer EQ and bring it to a boil faster than many of the stainless steel and silicone kettles with which it competes. As I briefly mentioned in the opening of this section, this is a rather small kettle. You will not be making tea for your entire family with this kettle if you expect them all to sit down and drink at the same time. This has been designed to serve an individual. I would be careful using the Outer EQ over an open flame, on account of its silicone-encased handle. That being said, you can always choose to hang this kettle from its handle, pulling the handle further from the flames. The handle itself will stay cool, allowing you to lift it for use without having to wait for it to cool down. The silicone also makes the handle more comfortable to grip. 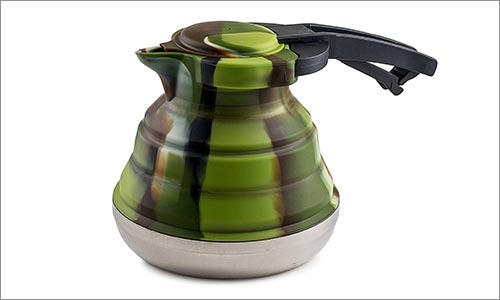 The handle’s width and slightly sticky quality makes it easier to grasp than the handles of most similar kettles. 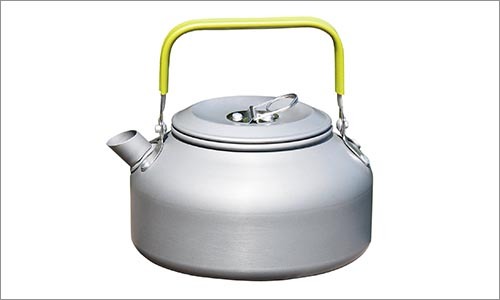 This unforgettable aluminum kettle has undergone the anodization process to add to its durability. You could, quite literally, throw it down a hill without causing much damage to it. Aluminum is one of the most heat-conductive materials used in creating cookware. Stainless steel and silicone kettles cannot compare to the swift heating that occurs in an aluminum kettle. Its short, rounded spout helps ensure that your tea makes its way into your cup instead of dripping down its side, as often happens with newer, low-profile spouts. The short spout makes this kettle much easier to store than long-spouted kettles which often get caught on other items in your backpack or in the trunk of your car. The fin-shaped silicone handle on this kettle’s lid makes it very easy to remove the lid when the kettle is hot; you can insert or remove the stainless steel tea ball at just the right time to make your perfect cup of tea. Unlike bulb-shaped knobs, you can simply pinch this handle with two or three fingers and never have to worry that your knuckles will come into contact with the hot surface of the kettle’s lid. Though the manufacturing company suggests using this kettle with a gas, propane, or alcohol-burning stove, it can also be used over a fire. I think they neglect to mention that fact because they are afraid that the silicone fin handle or the silicone cover on the kettle’s carrying handle will melt. I have used cookware with silicone handles over open flames many times in the past and can tell you that melting should not be a problem with this particular kettle. As long as you keep the carrying handle pointed upward, away from the flames, and maintain a calm fire, you shouldn’t have any problems. This Docooler kettle features a relatively low-profile design which spreads out over a six inch diameter and is only approximately three inches tall. Wide kettles such as this one are able to heat the water inside themselves much quicker than taller kettles with smaller diameters, because they hold the bulk of the water closer to the heat source. This particular low-profile kettle has been fashioned from strong, durable, rust-resistant, non-stick hard anodized aluminum. The excellent heat conductivity of the aluminum means that it will heat even faster than similar-looking, low-profile stainless steel kettles. Docooler has used plastic on both the carrying handle and the lid handle to help them stay cool for easy transportation directly off the burner or the fire. If you choose to use it over an open flame, remember to keep the flames small enough that they do not lick the handles, as these plastic handles are susceptible to melting. Aside from staying cool, another upside to plastic is that it can be easily shaped. This kettle’s three-pronged lid handle is very easy to grab hold of with two fingers and a thumb. A good grip is also possible on the kettle’s main carrying handle, which is quite wide when compared with the handles of other camping kettles. The carrying handle also features finger grooves so that your hand is less likely to slip as you pour your tea or transport this kettle from one place to another. You can easily fold down the carrying handle when the kettle is not in use, so that it doesn’t take up too much extra space and will not snag on other items when you store it. Although we featured an enameled coffee maker further up the page, I believe that this is the only enameled tea kettle to make its way onto our page. I’m not entirely certain as to why more enameled kettles aren’t as popular at this one. I like enameled cookware. It gives you all the easy-to-clean qualities of a non-stick coating without any of the potentially harmful PFOAs, PFTES or BPAs some non-stick coatings have come to be known for. Additionally, unlike many non-stick coatings, porcelain enamel, such as that used on this particular kettle, can be heated to very high temperatures. With the GSI Blue you will never have to worry about those sorts of things. Though porcelain enamel can be quite brittle at times, GSI put this kettle through a tough hardening process to ensure that it can withstand the rough environment camping brings. This kettle features a three ply stainless steel and core. The stainless steel provides further durability and protects it from denting and warping. The aluminum, a wonderful heat conductor, ensures that this kettle competes with the best of them in terms of how long it takes to boil water. We all know the importance of not overloading a backpack with heavy objects. What many people do not realize is that it is also important not to overload your car’s trunk with heavy objects either. Just as you will surely feel strain on your back from carrying a heavy pack, your car will feel the strain of a heavy load. Your gas milage will drop and your car’s systems will be placed under extra pressure. Weighing in at only 22 ounces, it will not add much weight to your backpack or your car. This teapot gave the LevelOne kettle a fair bit of competition for the title of Best Backpacking in our Top Three Choices for teapots and kettles. Ultimately, this non-collapsible kettle simply couldn’t hold a match to the space-saving provided by the LevelOne. Still, it is a very noteworthy item in its own right and should be seriously considered by any backpacker looking for a lightweight kettle. Weighing in at a mere 9 ounces, this may be one of the lightest kettles listed on this page. You will hardly even notice its extra weight in your backpack or car. As noted earlier, though you probably won’t notice its weight, you may notice its size. Luckily, this issue is alleviated by the fact that the MSR Alpine is just large enough to hold a small fuel canister. Even if you cannot manage to fit your canister inside, you can always use the kettle as a storage space for other important materials such as your identification cards and spare money or food. Though it isn’t collapsible, MSR appears to have done everything they could to make this durable stainless steel kettle as streamlined as possible so that it can easily slide in and out of your backpack without causing much disturbance to the other items you have packed inside. 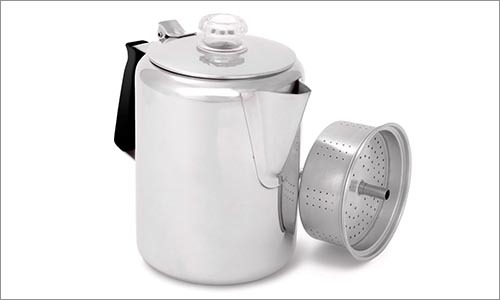 Its two handles fold down to the lid so that they take up virtually no extra space when the kettle is stored. Unlike the long or stout tube-shaped spouts on my other camping kettles, this one is a mere triangular protrusion which also takes up very little space. When pulled up and toward each other, these two handles work together to create one thicker handle so that you can get a better grasp. Thank you for taking the time to read through these reviews. I spent considerable time researching each of these products to bring you the best information possible. I hope that this page helps you make a well-informed and educated decision about your next camp-friendly coffee maker or teapot purchase.